3D printing has given people a whole new way of manufacturing and designing things, including folks in the automotive industry. 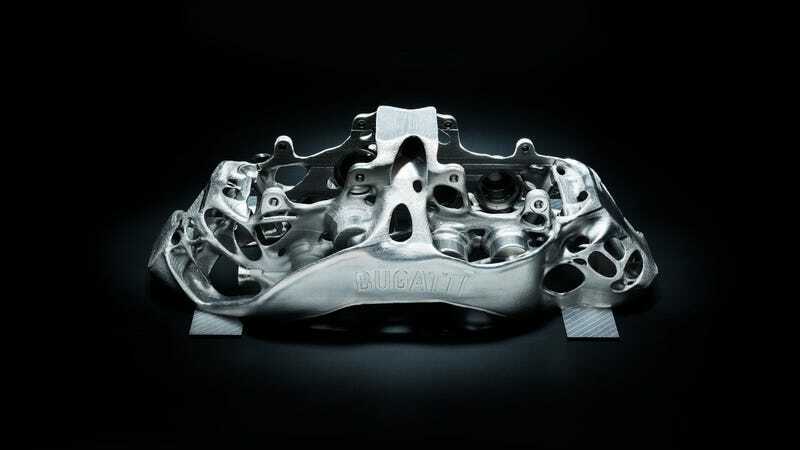 Bugatti, for example, is looking to 3D print brake calipers. This is actually a really cool development that could absolutely change the future of component manufacturing. While I’m sure this process is by no means cheap, there are some projects—space exploration, for example—where no expense is spared. Also, Bugatti. Bugatti developed this technology in conjunction with Laser Zentrum Nord in Hamburg, Germany, and hopes to enter the new caliper in series production vehicle trials starting early this year. This new titanium caliper’s architecture was crafted with minimum weight and maximum flex stiffness in mind. Caliper flex is a real concern in modern calipers, as manufacturers continue attempts to reduce unsprung weight from each corner. Calipers are an easy place to drop some weight, but the more material removed from the caliper, the more likely it is to flex under panic braking load. The Chiron currently employs a traditional caliper, forged from a block of high-strength aluminum alloy with eight pistons (milled from titanium, natch) in each of the front calipers, and six pistons in each of the rear calipers. The current aluminum front caliper weighs 4.9 kilograms, while this titanium 3D printed unit weighs only 2.9 kilograms, while providing a higher strength component. Each brake caliper takes about 45 hours to 3D print. The printer adds titanium dust to the platform one layer at a time, while four high-powered lasers melt the dust into the proper caliper shape. The material cools almost immediately, and then the next layer can be added on top. The full process takes exactly 2,213 layers of melted titanium dust. Once complete, the full caliper housing is heat-treated in an oven heated up to 700 degrees Celsius (nearly 1,300 degrees F). Once heat-treated, the caliper is then taken through a few long processes to ensure a smooth and bright finish. Will you ever see this kind of 3D printed technology trickle down to your Volkswagen Golf? Unlikely, but perhaps it could make it to your boss’s Audi R8 or Porsche 911. Something to look forward to.